He is a disc jockey, a turntablist, a master of wax. He is an opinionated old-school hip-hop head, and a part-time math geek. He is definitely a musician. He is also the DJ battle champion of the world. But in order to understand who Samuel M. Zornow ’08 really is, you have to understand what Samuel M. Zornow ’08 really does. This is what DJs do: they take two record players (but, please, call them turntables) and use them in ways your parents never would have imagined. An obsolete music listening technology is transformed into a cutting-edge music making technology. This is what DJs do: they scratch and they beat-juggle. Beat-juggling is taking small sections of two records and creating a new beat by “juggling” them using a fader. All this is done live and on-the-fly. DJ Shiftee may be one of the best beat-jugglers on the planet, and he has parlayed these skills into a successful battle DJ career, rising to the top of his niche of the broader DJ culture. After carefully assembling and rehearsing their 60- to 90-second routines, battle DJs compete head-to-head to determine who’s got the most talent and innovation. It’s like a chess tournament, if chess tournaments featured the members of the Wu-Tang Clan. “You have to have a stage persona,” according to Zornow, who says he becomes DJ Shiftee whenever there are turntables nearby. Zornow uses the reflective windows of his Mather Tower suite to practice dissing his opponents. Zornow’s journey to the top of the underground DJ battling community begins, ironically, with that most mainstream of musical experiences: watching MTV. Back when the network actually played music videos, young Sam fell in love with rap hits, circa 1995. Zornow’s hip-hop horizons steadily broadened, as he devoured all the underground stuff he could get his hands on. It didn’t hurt that he lived just outside of New York City, the birthplace of hip-hop and still the rap capital of the world. But this was hardly a full-blown adolescent rebellion: Zornow’s parents were on board from the get-go. “I think a lot of people had their eyebrows raised a bit when he was first getting into this,” says David M. Zornow ’76, Sam’s father. The family went to Sam Ash—Guitar Center for the headphones set—where Sam got his first pair of turntables. He bought them with Bar Mitzvah money. Zornow says that after a few weeks of lessons from a shifty Sam Ash salesman who charged 50 bucks an hour and, in retrospect, “didn’t know how to scratch,” he turned to instructional videos to hone his skills. It wasn’t long before Zornow tasted his first morsel of success. “Right when I got the turntables pretty much, they asked me to DJ a pool party for our middle school graduation.” Who needs Ibiza, or, for that matter, Mather Lather? Armed with the skills, the style, and the sobriquet, Zornow entered his first competition in 2002. It was at a car show. In Queens. Surrounded by skimpy bikini models and tricked-out rides, the Zornows watched proudly as their son made good on hundreds of hours of practice. After the show, Zornow met DJ Cutfucious, a fellow DJ battler with whom he had been chatting online for several months. “He would always send me messages and send me files of his routines and ask me to critique them,” says Cutfucious, a.k.a. Bernard Au. Au invited Shiftee to chill with his DJ crew, the Lo-Livez: DJ Cutfucious, DJ Precision, DJ Boogie Blind, and DJ Tragik. DJs form crews to critique each other and experiment with new sounds. It’s a dying tradition, a remnant of the early days of hip-hop. He would travel to Queens on the weekends to practice, 90 minutes each way by public transportation. “When we first met him, he was really hungry. All he wanted to do was get better,” Cutfucious says. Zornow continued to battle throughout high school, traveling with his dad to competitions around the United States. Out of nowhere, Shiftee captured the New York DMCs—a tournament on the major battle circuit—in 2003, and the Delaware DMCs in 2004. After a particularly devastating loss to cross-town rival DJ ie.Merge in the 2004 New York DMCs, Shiftee was officially inducted into the Lo-Livez. The invitation, following two years of apprenticeship, came on the eve of Zornow’s departure for Cambridge. 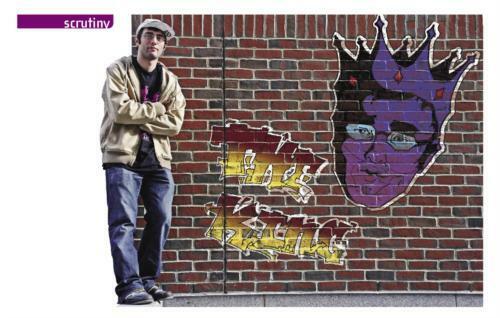 Arriving at Harvard in the fall of 2004, Shiftee thought that he was done battling forever. He decided to focus full-time on his schoolwork and on the music-making side of his DJing. Word quickly got around campus, though, that this kid was the genuine article. Xavier A. Taboada ’08, a blockmate, remembers congregating in Matthews, with practically the whole entryway huddled around Sam’s turntables, to marvel as his fingers flew across the vinyl. Soon thereafter, Zornow began fielding requests to DJ parties around campus. He has made a decent business out of it, even if it means spending Saturday night as a dance commander rather than a foot-soldier of funk. Rocking the d-halls has never been a top priority, however. “If people want me to do things, I’ll talk to them,” Zornow says. “But I never sought out parties on campus. Zornow keeps things interesting for himself by scratching over records and blending them together to create a seamless mix. “I’d like to think that I put some flair into it,” he says. Audience reaction ranges from ecstatic post-party accolades—and the occasional flirtatious co-ed—to shrugs of the shoulders. “Some people, I’m sure, would have the same time if they were listening to an iPod,” he says. But party organizers have been very satisfied with the results, both aesthetically and in terms of Shiftee’s marketing potential. He has DJ’d several House formals and the last two iterations of Mather Lather, where he was sequestered in a lather-proof box. Zornow has formed a particularly close relationship with the South Asian Men’s Collective (SAMC), DJing all seven of their benefit dances over the past four years. Being Harvard’s favorite DJ is not really a full-time job, however. Zornow’s math work, although not as important to him as it once was, takes up a large chunk of his time. And he still practices juggling and scratching. A lot. In September, after more than three years away from the battle scene, Sam impulsively entered the 2007 DMC Battle for USA Supremacy. The DMC is the granddaddy of them all, a family-run organization that hosts DJ competitions in countries across North America, Europe, and Asia. According to Tuason, about 300 DJs from around the United States compete in DMC competitions, and events typically attract audiences of roughly 400. Zornow steamrolled through the American event on Sept. 15 in New York City, earning a spot in the DMC World DJ Championship in London. There, on Oct. 6, Shiftee—overcoming animosity from European judges and an audience that seemed to prefer Euro-trash techno over his experimental hip-hop sounds—captured first place in the Battle for World Supremacy. Sam Zornow is, for the moment, recognized as the best battle DJ on the planet. And amidst all the House parties, math problems, and world-class DJ battling, Sam’s been making a lot of music. Zornow did not come to Boston looking to DJ for a hip-hop group. But hanging out at Massive Records, the city’s since-shuttered haven for hip-hop heads, sometimes these opportunities find you. The duo, players in Boston’s underground hip-hop scene for eight years, was looking for a new DJ. They picked up Shiftee, but didn’t know just what they’d gotten until one of their first shows together at The Muddy River Smokehouse in Portsmouth, N.H. Zornow’s performance set other DJs’ tongues wagging. Shiftee meshed well with Awkward Landing, as his experimental tastes added new layers to the group’s classic hip-hop sound. The group is palpably joyful in its creative exploration. Congregating in Zornow’s Mather Tower suite, Shiftee, Normal, and J.Ring knock back long-necks of High Life and joke around as they experiment with new beats for their live sets. Shiftee spins a record, bobbing his head as his fingers instinctively work the vinyl and fader. Normal and J.Ring bounce fiendishly around the cramped space, mouthing lyrics, beat-boxing, and occasionally bursting out into impromptu verse. The two MCs motor-mouth practically the entire time; their DJ is quiet, almost reserved, by comparison. “We gotta pry out of him what he’s doing a lot of the time, just out of our own curiosity,” says J.Ring, a.k.a. Jason Ring. “He’s a relatively quiet man, but he has a quiet confidence and he knows damn well that he belongs up there,” Elrick says. On stage and in rehearsals, Shiftee simply does his thing, letting his skills (not to mention J.Ring and Normal) do all the talking. Zornow’s pending graduation in June, however, will complicate practices and performances with Awkward Landing. But even if he does leave the group—which he says is unlikely—music will undoubtedly continue to be the major focus of his life. He hopes to enroll in a graduate program in music technology at NYU and continue to hone his theoretical skills. He is currently looking for representation—a manager, an agent, anyone who can parlay his battling and hip-hop success into more live showcases. He has also rededicated himself to battling, devising new routines and practicing a daily regimen of new scratching techniques. Long-term, he says he would like to produce and perform music that is broadly accessible to the average music listener. But does he? The dialectic of underground versus mainstream is a source of underlying tension in the DJ and hip-hop worlds. Everyone talks about wanting to make it big, but the community takes great pride in its distinctiveness and authenticity. A few former DMC champions have found mainstream success, most notably A-Trak (a.k.a Alain Macklovitch), who won the 1997 World DJ Championship at age 15 and is currently DJing for Kanye West. Zornow understands that being part of a niche subculture has allowed him to rise to the top very quickly. Zornow also possesses a sometimes-alienating, almost self-righteous old-school sensibility. He’s deeply nostalgic for the golden era of DJing in the late 1990s, and laments the rise of “custom records,” which DJs commission specially for their battle routines. He can turn downright nasty when discussing certain DJs who have found mainstream success by peddling what he considers a watered-down version of the craft. Sam is particularly venomous towards Girl Talk, pop-and-rap mash-up artist Gregg Gillis, who is currently tearing up a hipster joint near you. “Girl Talk is like the epitome of the death of the DJ at the hands of technology...he creates these soulless, terrible-sounding mixes. When he performs, he pretty much just hits play on his laptop and then dances around, and people give him props for being a DJ. The future could not be brighter for DJ Shiftee: he is at the top of the battling game, he DJs for a dynamic hip-hop group, and he continues to progress as a musician and producer. Sam Zornow may never enjoy mainstream pop success. But when you can excel at something that you love, who needs MTV anyways?